Take the plunge with Shark Dive Xtreme. At Shark Dive Xtreme, scuba dive with massive sharks, cheeky sea turtles and huge rays without a cage! 14 years +, no dive experience required. Kids 14 and older can take the plunge with Shark Dive Xtreme for the opportunity of a lifetime! Come face to face with huge critically endangered Grey Nurse Sharks, sea turtles, stingrays and a vast array of other marine life. Experienced instructors will prepare you by teaching the basics of SCUBA diving in the classroom and training pool so you feel confident before meeting the sharks. The 2.5 hour experience includes a scuab dive in Shark Harbour, the 4 million litre ocean tank. Friends and family are able to watch all the action from the underwater viewing tunnel. 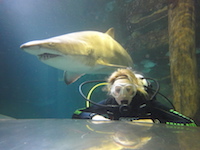 Shark Dive Xtreme is great for first time and experienced divers. All equipment is supplied, just bring swimmers and a towel. Optional in-water photos are available to view and purchase following the dive. Bookings are essential. Medical restrictions apply.